The modern design of these HDMI Wall Plates will look great with any decor and are sure to blend perfectly in any home or office. The simple installation procedure makes these wall plates an ideal choice for anybody looking for that perfect finishing touch. These wall plates support all current HDMI features including 3D, 4K (Ultra HD), Audio Return Channel (ARC), HDMI Ethernet Channel (HEC) and more. 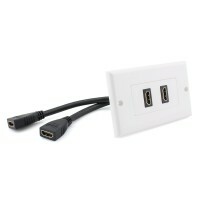 Each HDMI Wall Plate is designed to conveniently accept a standard HDMI Cable on the front and on the rear. This HDMI Wall Plate features a flexible tail connector on the rear, which makes this the ideal solution for space restrictive installations. This high quality wall plate will accept a standard HDMI cable to be connected both at the front and at the rear. 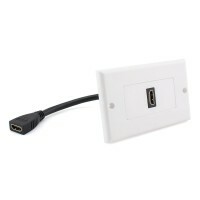 This Double HDMI Wall Plate features tail connections on the rear which is ideal for installations in tight spaces. The dual HDMI ports will allow connection of up to two source devices to the same display, or you can route the second connection to a display in another room.